The owners of Angastons ‘ Doddridge Forge’ are placing the workshop on the market. The Angaston & Penrice Historical Societies President, Bill Gransbury, is in talks with the real estate agent, in an effort to seek a pathway that can retain the workshop for the benefit of all. 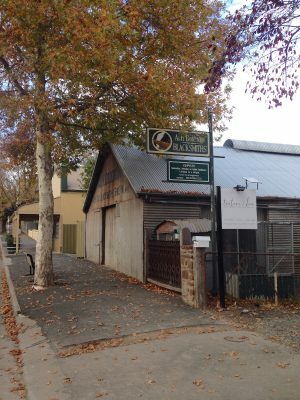 The blacksmith workshop has a history and heritage that makes it very important to retain for the future of Angaston and South Australia. There are precious few forges and workshops in our state as it is, and we are hopeful that a solution can be found to keep the workshop in the hands of the community. The A&PHS are holding a meeting at 5pm at the Old Union Chapel on Friday 5th October. Parties involved with the running of the workshop are encouraged to attend. The A&PHS will be planning to raise funds to enable the society to purchase the site. The Society has created a business plan ( see below). With only three weeks to reach the target. Please help us save this magnificent Blacksmith Workshop by donating what you can and by spreading the word.